Cozy Chicks: Always a Celebration! My husband and I celebrated our anniversary on Monday. We tend to find excuses to celebrate, whether it be to commemorate our first date, or the day we got engaged, or this one -- the biggie -- our wedding anniversary. We'll hit a milestone next year but so far we have no big plans except to wonder about how the time has flown. Seriously, when we were kids, the only people married this long were old. We're :::cough, cough::: not. Anyway, in honor of my husband's patience for me all these years, I thought I'd share a few photos. The top one is -- you guessed it -- our wedding day. I opted not to crown my bridesmaids with the hats and head-rings (is there a proper name for those horizontal floral bands that encircled bridesmaids head? I can't remember.) that were so popular back then. I don't know why, but I think my girls voted the idea down. No matter. I think they all look so very lovely. I can honestly say that I'd planned a multi-colored wedding from the time I was a young girl, well before they became all the rage. 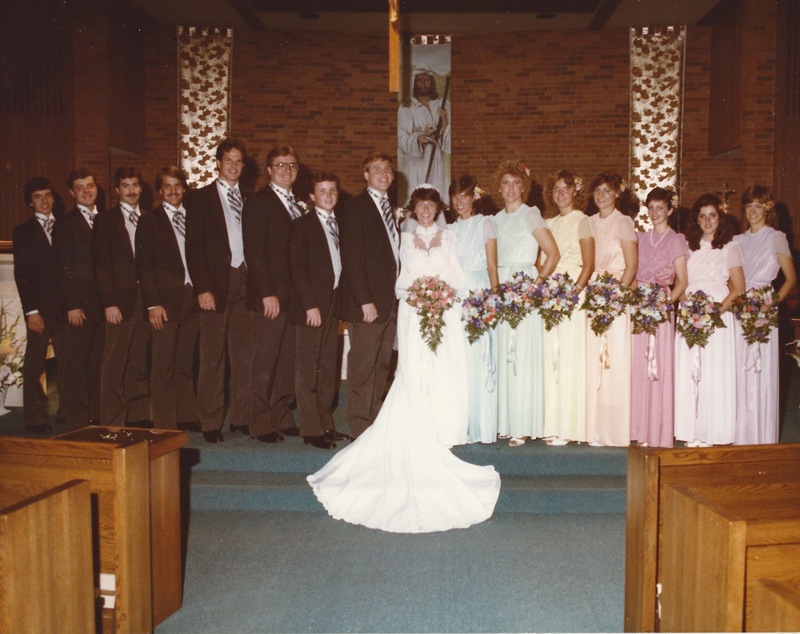 The one thing I insisted on was that the girls come down the aisle in color order that resembled an actual rainbow. I didn't want them photographed out of order even once. And believe it or not, I got my wish. Fast forward many years and here are photos of when our three daughters surprised us with an anniversary party and -- the most beautiful of mementos -- a quilt made up of photos of our family over the years. was when we opened it and I realized what it was. I was overcome -- as evidenced by this shot. My husband was, too. This second picture gives you an idea of the quilt's size. It's enormous. But I suppose it would have to be to hold all the memories and love that it does. It's one of our most cherished treasures and I wanted to share it with you. That's all I have for today... sharing a little bit of our recent fun. I'd like to know more about what you like to celebrate: weddings, kids, work, personal achievements, health? What's your favorite non-holiday celebration? Oh Julie...Happy Anniversary! "My name is Adrienne and I am a quilter." Need I say more to explain why I'm smiling from ear to ear and asking questions like who designed the quilt? Who transferred all those photos (and got them away without your knowing)? Who put the quilt together? And who quilted it? What does the label say? I just know there's a fabulous label on it. You and your hubby are soooo blessed (which is something you know as is evidenced in all your blog comments about your kids). The "girls" (my adult daughters do let me still call them "the girls") must have planned this forever. Oh I just love it and can feel the joy and see the tears fall. Where do you keep the quilt? Does it fit on a wall, the back of a chair? Thanks for sharing. You're such a dear:-)I'm still smiling! Happy anniversary Julie! I like to celebrate the date my boyfriend and I met, and when he moved in (last year), so that is not that long ago. I'm not that big on celebrations. We both don't like to celebrate our birthdays, we just go out to eat somewhere nice together. And of course I buy myself a huge pile of books. Happy anniversary, Julie! Loved all these pictures, and that quilt is definitely cherish-worthy. Happy Anniversary!! I know the meaning of a quilt. My mother-in-law quilted us an oversize king quilt for our wedding. It is on our bed at all times and she put a label inside that says live, love, laugh for a lifetime. It is one of my most precious items I have ever been given! I hope you both had a wonderful day!! Happy Anniversary! My Husband and I love to celebrate our wedding anniversary. We try to come up with something fun and exciting to do every year. Love your quilt, such a special idea. Adrienne, I can hear in your comment the excitement that we feel whenever we look at our quilt. 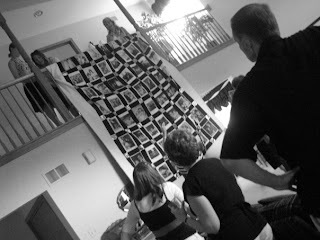 Our beautiful girls arranged for it and transferred all the photos. My sister-in-law put the pieces together (as she has for all three of our girls when we've put together their graduation quilts) and took the finished arrangement and backing to a professional who sewed it all together. We keep it in a chest in our room because we're so afraid of it getting harmed. But we pull it out often to enjoy. I'd love to display it but I don't have a wall big enough! Aurian - that sounds like so much fun! Always great reasons to celebrate! Dru - you know better than most how much a quilt can mean to a person! Thank you! Thanks, Heather! It's a wonderful treasure! Jeannie - We usually try to come up with something new and different and fun. The anniversary our daughter's threw was a real surprise! oh my, that is a verra lovely thing to do! Las Vegas with The King, aka Elvis!, doing the ceremony. I think it was better than our actual wedding! Next year we celebrate our 13th anniversary and we are planning on renewing our vows at the New Orleans Wax Museum! New Orleans is our second home, and I wanted something NoN~Vampire but still NOLA. I already have my dress, and cake picked out. Happy Anniversary to you both. My marriage did not last 8 years and I have been single every since. I envy those who are able to weather the trials and make the long haul. The quilt sounds wonderful and will be a keepsake for generations to come. If it does not have a label, please put one on it so future generations will know who made it and why.